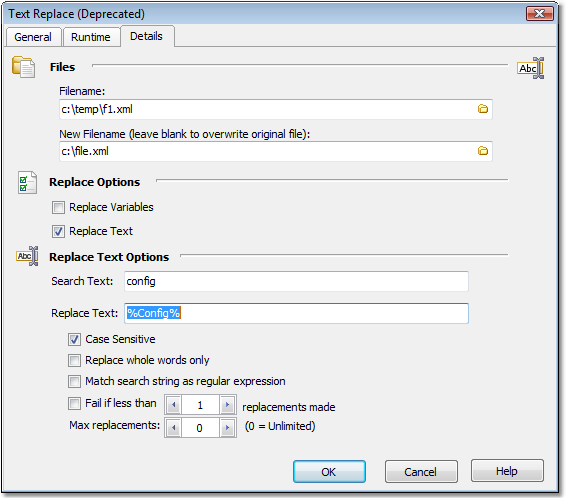 NOTE: This action has been deprecated and replaced with the Text Find / Replace Action and the Replace Variables action. Please use one of these actions where possible. The text replace action allows you to replace strings and FinalBuilder variables in a file with specified values. If you want to only search for content, use the Text Find Action. Specify a source and a destination file. If you want the replacements to be written to the same file as the source, leave the 'New Filename' blank. Note that the Text Replacement action does not discriminate between FB Variables and regular percent signs, so either escape "real" percent signs as "%%" (these can even then be replaced with % using Replace Text), or use a different notation and replace specific strings instead. The action can be set to fail if an insufficient amount of replacements are made. This is useful to check that there isn't a syntax error or other mistake in the text file. The action will replace only the first N matches it finds. Set to zero to replace all matches.